International Association Of Independent Journalists Inc. :: View topic - The Fortress on Tour 2017! Posted: Tue Mar 21, 2017 1:17 am Post subject: The Fortress on Tour 2017! Delivering newspapers these days is almost an anachronism. 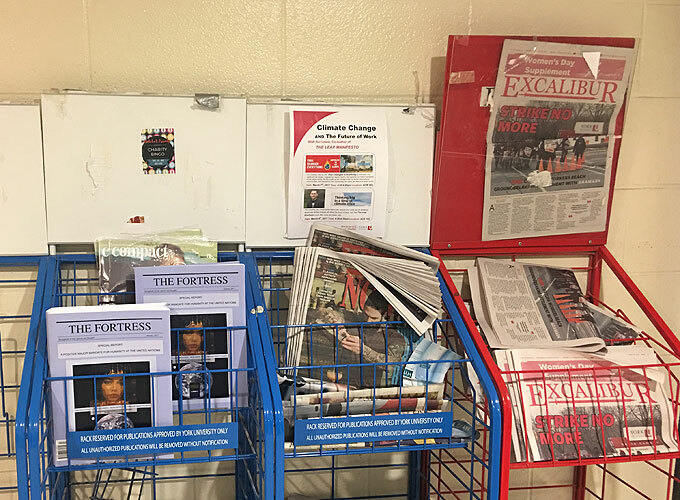 Even our newspaper called The Fortress has become a magazine rather than an expensive tabloid sized newsprint paper printed in the thousands for each issue. 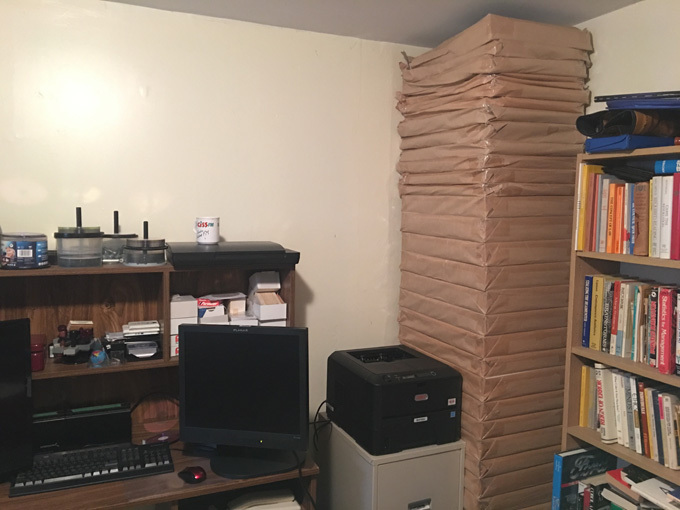 There is a stack of newsprint from the floor to the ceiling of sheets of newsprint that I call my monument to the traditional newspaper. It’s almost mindboggling to think of how many tress, how many forests were defoliated to produce the paper needed for newspapers, which unlike books that can last for centuries, are read and thrown away in less than a day. Just mindboggling waste and yet this is - or was – the way we got the news. My monument to the newspaper industry! 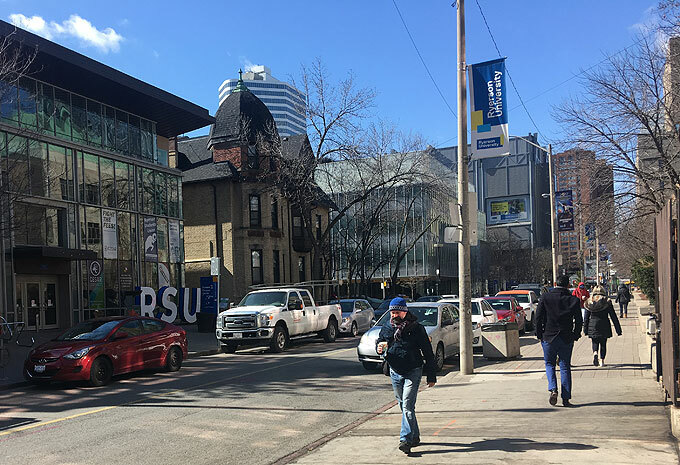 My first stop was Ryerson University which has one of the best journalism schools in Canada. 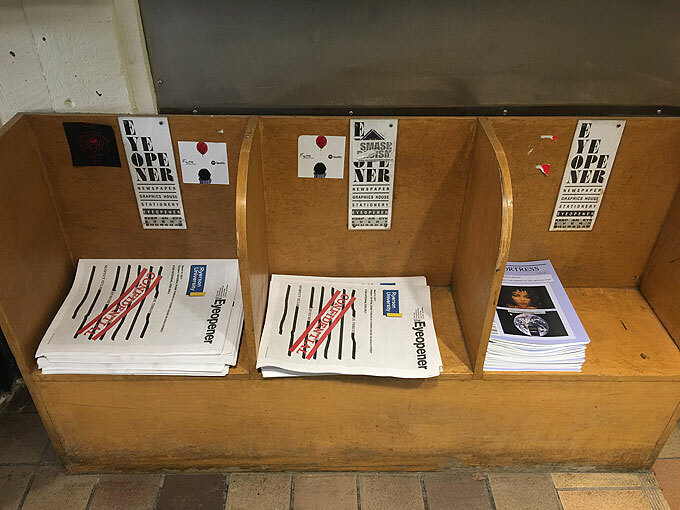 The biggest newspaper is still the Eyeopener and I place some of our Fortress right in their wooden racks in the Jorgensen Building as can be seen here. The wooden racks for the Eyeopener! The next stop was the University of Toronto also located in downtown Toronto. 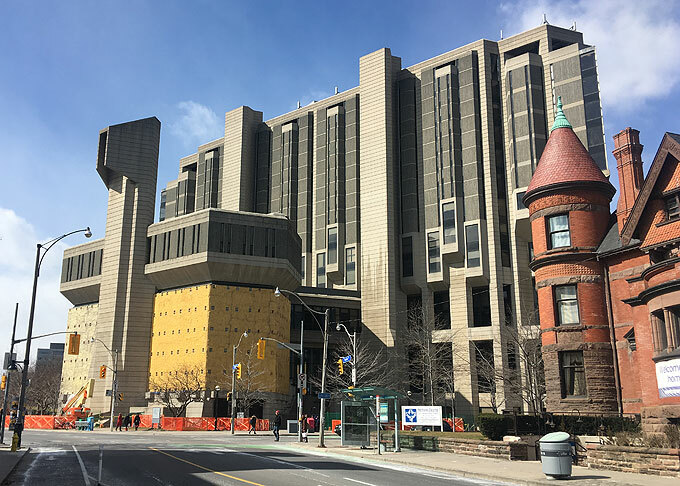 I usually deliver The Fortress to the Robarts Library which is this rather unique bit of architecture as you can see in the photo. Interestingly they seem to be renovating a portion of the building which houses the rare books library. Maybe insolating the section as the humidity and temperature are controlled to keep the books well preserved. The Varsity is their paper here but the racks seem to have disappeared but The Gargoyle rack is still there, so sad and a sign of the times. 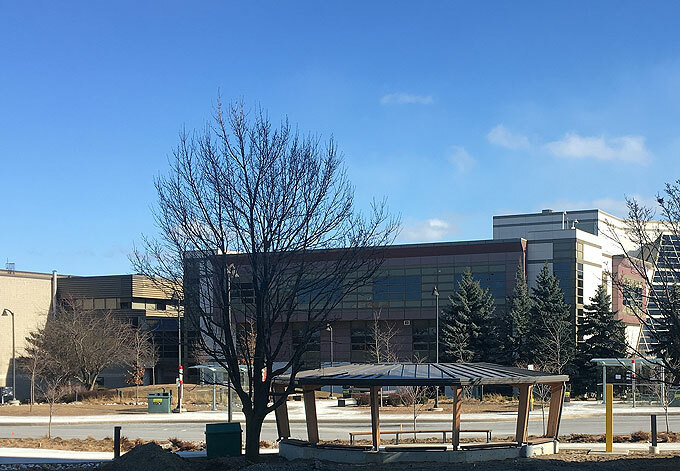 I then drove east to Centennial Collage which is also under renovation. The Courier used to be their paper but now you get a dead link to what should be their website, so long live The Courier (not). 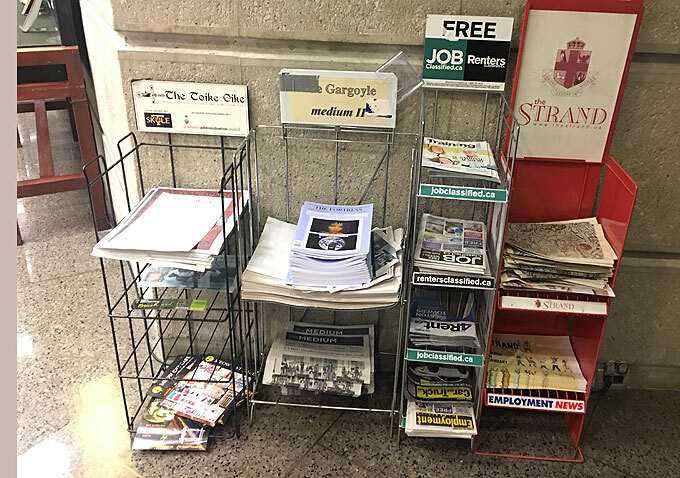 There are hardly any racks for newspapers and I plopped a few in this information rack display near the information center. No more newspaper racks but this one worked perfectly! 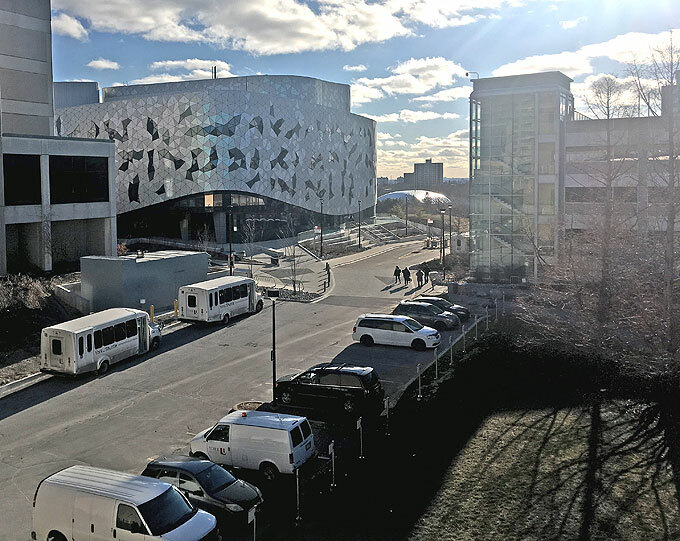 Street view of York University! 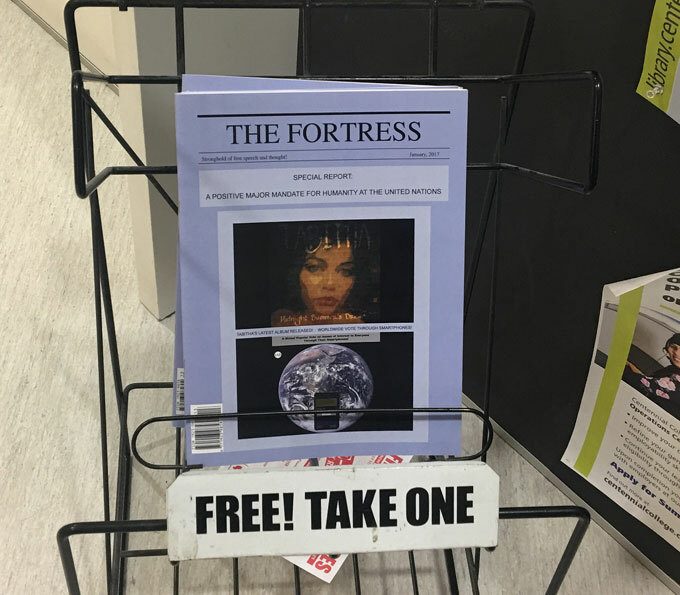 We stashed The Fortress in a traditional newspaper rack at the Steacie Science building (by the library) as we sometimes do. York’s newspaper is still the Excalibur that rules here and that paper sat along ours slightly out of proper frame. Like the other universities York is always under construction, buildings and stadiums sprouting up all over the place and townhouses everywhere. When I went there it was barren waste land with a few principle buildings in the middle. How times have changed! The Fortress beside The Excalibur! 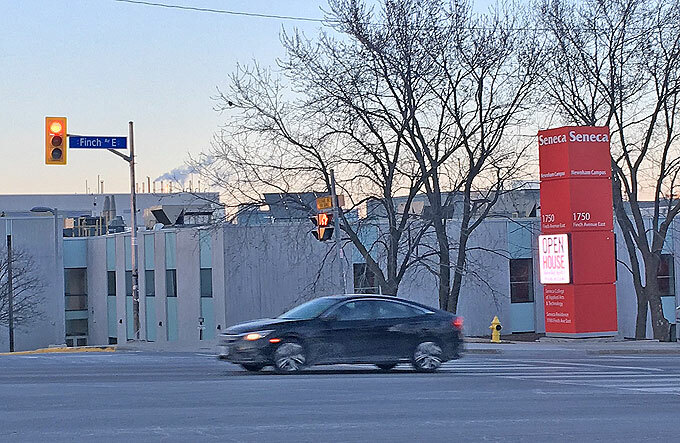 Street view of Seneca College! Back East to Seneca College. The Buzz used to rule there but apparently no more in physical form, or in digital form as the old web address points to a dead end. I dumped some by one of the entrances and moved on. Another pretty rack for a magazine but none for a newspaper anymore! 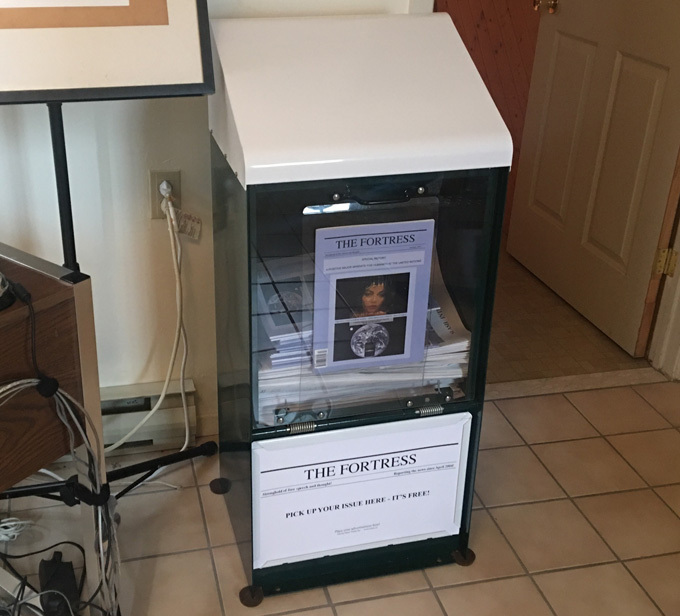 Our final resting place for The Fortress was our own Fortress Newspaper box located in our offices here in Toronto. I stacked them on old versions of the real tabloid newspapers. Sure this is old school and a tradition that is fading fast. But I am old and old traditions die a hard death. And as long as I am in charge we will continue to put out and deliver a physical representation of the events, news and opinion pieces sent to us by our journalists in our own little “rag” called The Fortress! 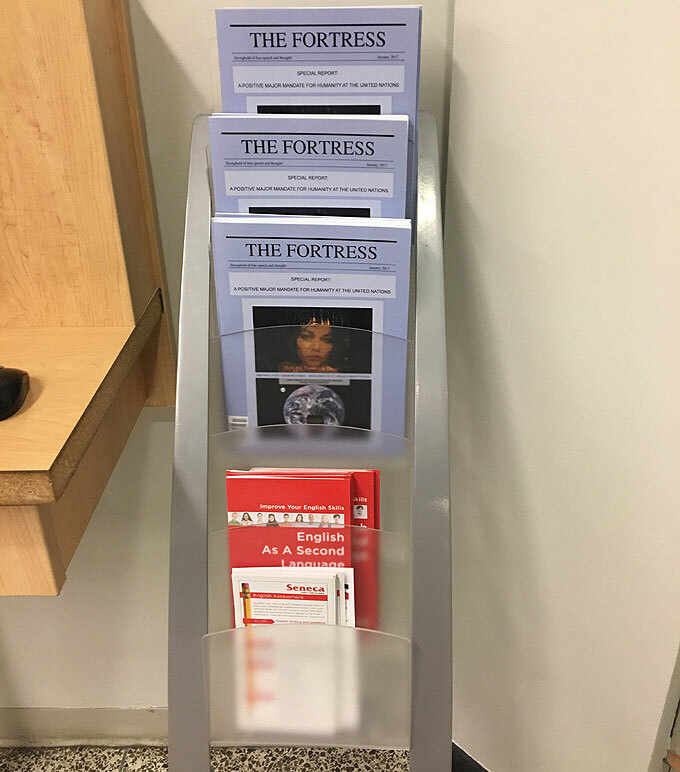 The Fortress in its own newspaper box! More updates if I do a second run but that is it for now. I find it a bit distressing that so many newspapers run for decades at these institutions have been abandoned as of late. Even the web based versions disappeared at many colleges and universities as I guess when the print run ended most student journalists would just as well post under their own name or publication. This is a shame for both the original publication and the college or university as a group of journalists have more sway to get access for articles and a readership then as individuals. But what is done is done. Time and technology move on and what seemed to be a permanent institution of the Fifth Estate wither and die as each year my pilgrimage delivering The Fortress shows as time marches on.